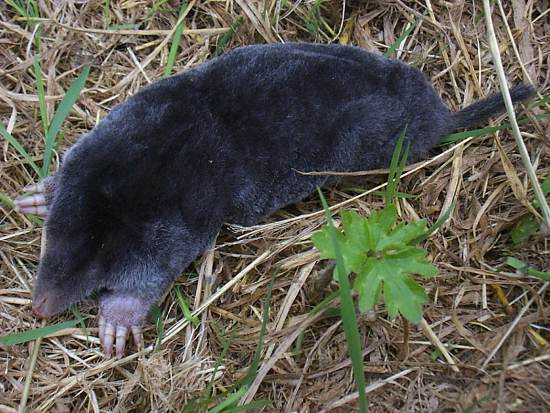 Moles live underground and surface only occasionally. They have very poor sight and feed mainly on worms and insect larvae that they find by the sense of touch. These remarkable underground creatures have cylindrical bodies and powerful front claws that are ideal for digging. Moles create their complex labyrinth of interconnected chambers by burrowing close to the surface, often leaving visible ridges. A trail of 'mole hills' betrays the route the burrowing Mole has taken, and as seen below it is rarely a straight line. 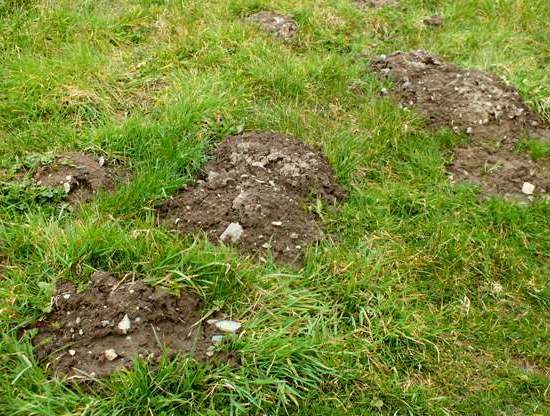 Mole hills are places where the Mole has pushed up earth above the surface; new mole hills appear during periods when the soil is damp - generally spring and autumn, but as the picture above proves they are active even on the coldest of winter days. The earth from mole hills is greatly valued by gardeners as a potting material, because it is finely broken down and free of wireworms and insect larvae that might damage the roots of young plants.